This textbook provides a concise introduction to the mathematical theory of fluid motion with the underlying physics. Different branches of fluid mechanics are developed from general to specific topics. At the end of each chapter carefully designed problems are assigned as homework, for which selected fully worked-out solutions are provided. 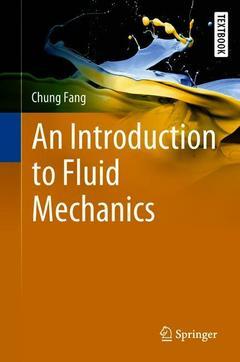 This book can be used for self-study, as well as in conjunction with a course in fluid mechanics. Essentials of Tensor Calculus- Fundamental Concepts- Continuum Mechanics and Balance Equations.- Fluid Statics.- Ideal Fluid Flows.- Viscous Fluid Flows.- Compressible Fluid Flows.- Dimensional Analysis and Similitude.- Appendix: A Brief History of the Development of Fluid Mechanics. Chung Fang is working at the Department of Civil Engineering at the National Cheng Kung University in Taiwan. His research interests cover fundamentals in granular, soft and rheological matter its applications. He teaches fluid mechanics for more than a decade.